Happy Sunday everyone. 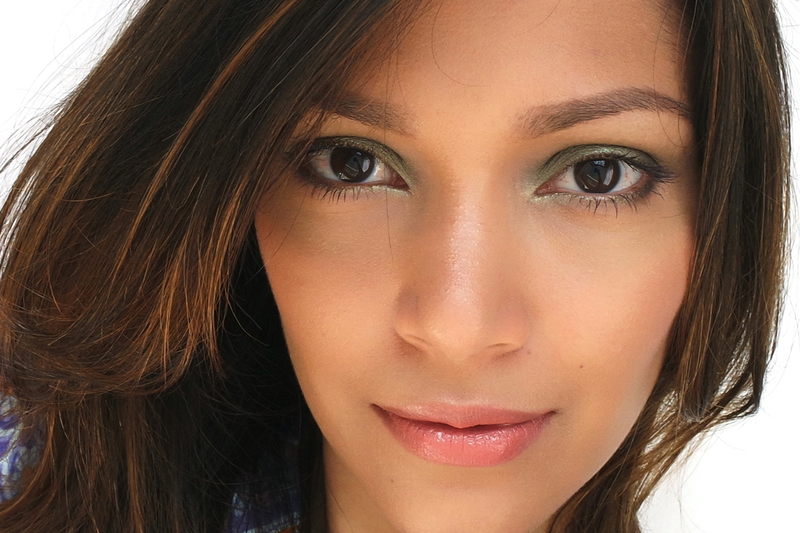 Here’s the final installment of my TF Spring 2015 makeup posts. After several weeks of ‘testing’ I’m finally ready to put down my thoughts on these new wet & dry eyeshadows. The timing is perfect too as I just saw all three of them listed on the Selfridges website! P.S- For swatches of all three duos, head on to this post, where I had penned my first impressions. There’s also a post on the new limited edition nail lacquer Indigo Night over here. Without delay, here’s what I have for review. Introducing three new Eye Colour Duos using a new formula that perfectly captures pigments and light on the eye with flawless sensorial application. The shades Ripe Plum, Raw Jade and Crushed Indigo are lifted directly from nature but are intensely infused with metallics to create an effect that is a perversion of nature. Contrasting light and dark shadow duos create instant dramatic tension. Each duo comes with one ‘opaline shade’ and a ‘deep metallic shade’. To me what really sets these duos apart from other wet & dry palettes are the rather unique opaline shades. Worn alone these are very feminine and sweet, but layered over the deeper shade is when they truly come alive, completely transforming the deeper metallic shade into a mesmerizing, hypnotic colour. Over a couple of days I tried wearing these in several ways. Wet, dry, without primer and with. I feel the best is obviously over a primer, wet. However for the look I plan to share today I wore them dry over a new primer I happen to be testing. I like the result. The colour looks very exotic and yet day time appropriate. Here’s a close up of the Raw Jade Duo. As always, let’s start with packaging. 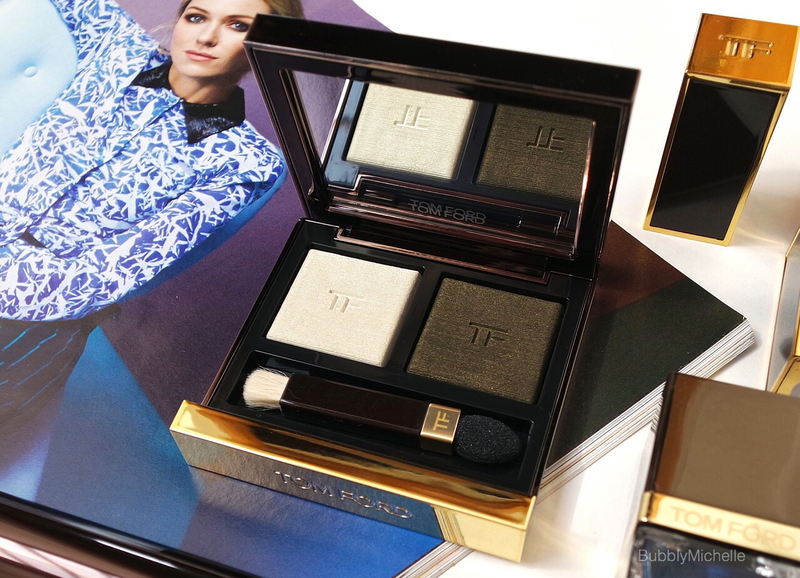 These eyeshadows are set in a case identical to the regular TF eye quads, only difference being they are smaller in size, obviously to accommodate just two. 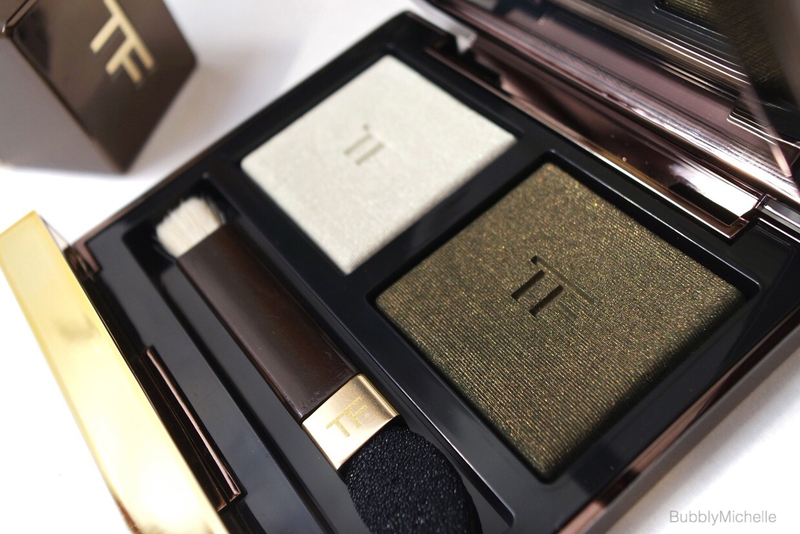 The outer packaging is a rich mahogany with gold accents where the Tom Ford Logo sitting pretty in the middle. Inside you find one double ended applicator (the regular quads contain two) and a nice sized mirror with the Tom Ford logo engraved in. Overall the quality is the same in comparison to the regular TF packaging. Moving onto the product, the opaline shade in this is an iridescent white which transforms into a cool minty veil once applied, and the metallic shade is a gold shimmer infused khaki green. 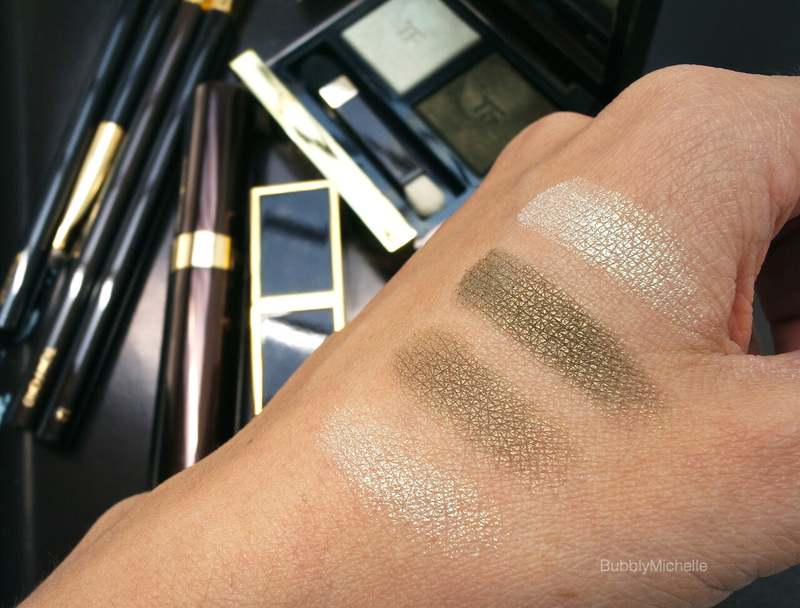 When swatched the texture of these are similar to the usual eyeshadow formula, however with a wet application, you do get a far more intense swatch. One thing that should be noted about these eyeshadows is that they go on very smooth, and are easily buildable even though they don’t feel creamy or highly pigmented when swatched. I noticed that even when used dry, you can really keep layering on the colour to build it up to an almost full coverage opaque look, which is something I like about these eyeshadows. Let’s look at some swatches so you see how they perform wet and dry. As you can see, there is a distinguishable difference between the dry and the wet swatch, although both are just as smooth and uniform. I find the NARS Dual Intensity eyeshadows (that are also a wet and dry formula) quite comparable to these. Interestingly the price is also somewhat similar. Pigmentation wise (when considering a single swatch) I find that some of the NARS Dual Intensity singles (such as Subra and Dione) swatch smoother and almost creamy with better colour payoff when used dry. However, when used wet, both swatch with similar intensity. 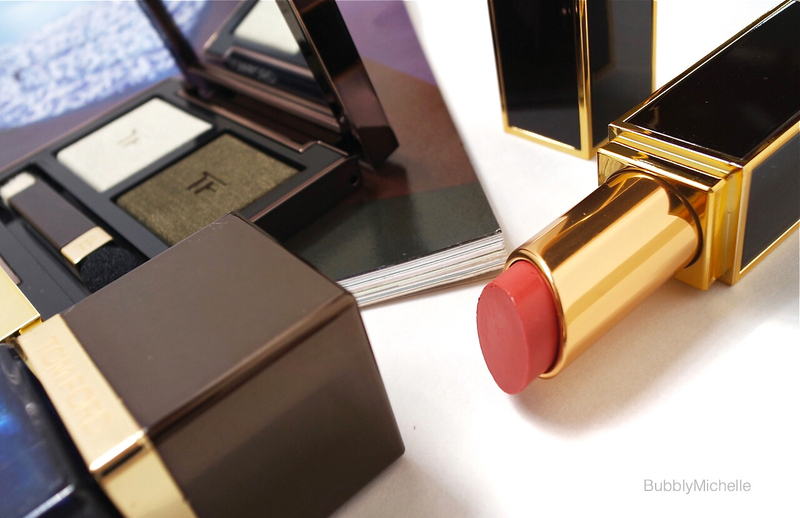 Overall I believe Tom Ford really excels in longevity in it’s wear, it’s what sets them apart from other brands, including the NARS singles we spoke of. This particular duo wore well for almost 10 hours before I cleansed it off. Also noteworthy, I experienced no creasing and no fading. Now onto an eye look I created with this duo! 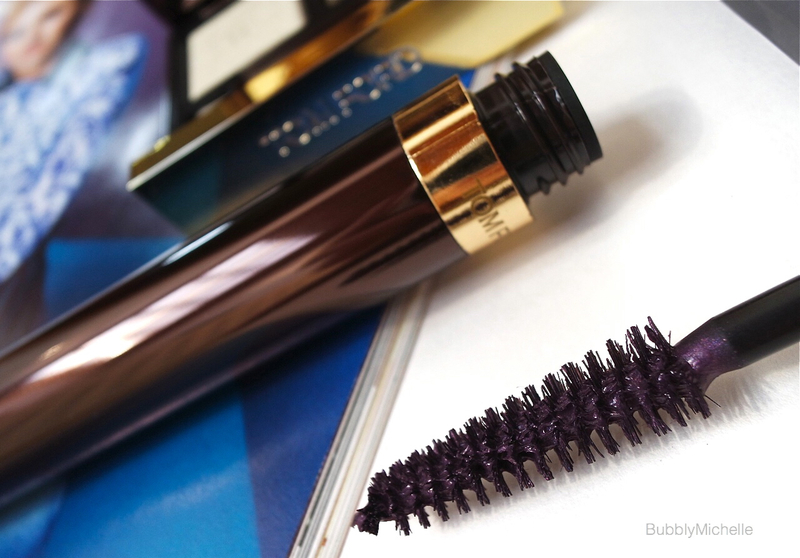 I decided to use the new Tom Ford Extreme mascara in Black Plum for added interest instead of plain black. This mascara is a new colour for Spring. I really love how it volumises and gives lashes an effortless dramatic air. Only downside being that I find this makes them feel a little stiff! For the lips I used Sultry, a new Lip Shine that’s set to release soon. I toned down the warmth of Sultry by pairing it with one of my ‘boys’ Peter which is a shimmery beige. Sultry is a new favourite of mine and I have been wearing it loads these last couple of days as it goes well with my new golden tan! I love how hydrating it feels on the lips and for a supposedly sheer coverage lip product these are pretty pigmented! Highly recommend checking them out when they release. Here’s the final look. A somewhat spring appropriate, almost butterfly like eye look. I love how the opaline shade draws attention to the eyes. Eye Colour Duos will be retailing at SGD85. Available from March 2015 at Tangs Orchard Tom Ford Counter. Already available online at Selfridges. The light green is so pretty on and makes your eye pop. I would not have guessed that’s how it would look on the eyes. I expected it to swatch in a deeper green colour but I like it like this, more luminous! 😌👌And Sultry is beyond gorgeous! 😍 Is it LE or a permanent? I love the formula! I recently got Bare and it’s lovely! It looks more vibrant cos it’s layered with the white opaline shade 🙂 By itself it’s pretty much the colour of the swatch! And yes Sultry is heaven! If I remember correctly it’s actually joining the permanent shades. That makeup look – just gorgeous!!! Lovely.. Thank you so much! 🙂 You are so kind! This looks so beautiful on you! I cannot wait for this duo to appear stateside! Thank you so much! It’s definitely worth looking at 🙂 Very unique concept! Oh, I MUST have this Jade duo. The color is so beautiful on you! Have just added it to my list. I hope it’s already released here!!! It looks absolutely stunning on you! what primer do you recommend, and that you normally wear? Thank you! I usually use the Benefit Stay don’t stray primer in the lighter shade and have just started testing out the Urban Decay Primer potion in the original shade 🙂 I still like the Benefit one cos it really corrects any redness on the lids and I can start my eyeshadow on a ‘clean canvas’ and I have never had a problem of my shadow creasing while using it.